Should The Blackpool South Branch Be Electrified? I can find nothing on the Internet, which states whether the branch line between Kirkham and Wesham and Blackpool South stations will or won’t be electrified. However, I did get create this Google Map of Kirkham West Junction, where the lines to the two Blackpool stations divide. Kirkham and Wesham station is to the East. Blackpool North station is to the North-West. Blackpool South station is to the South-West. This image was captured during the recent construction phase on the Blackpool Branch Lines. As my train to Blackpool North on Monday afternoon passed the junction I took these pictures. It looks to me, that the contractors are doing the following. Laying some new track at the start of the branch line. I also think, that the junction is being electrified. The electrification could be for the following reasons. It is the start of electrification of the branch. Network Rail are providing an electrified turn-back facility at Krkham and Wesham station. It could also be sensible future-proofing to make sure the branch can be electrified easily in the future. If the branch is going to be worked by Class 769 trains or other bi-mode or battery powered trains, then I believe the work becomes clearer. Trains from Blackpool South would have an electrified place, where they can change to electrical power and wait until the main lines are clear before crossing over to the Preston-bound track. Trains to Blackpool South would be able to wait in Kirkham and Wesham station, until the line to Blackpool South was clear. Trains to Blackpool South could of course start their journey, as soon as the train from Blackpool South is waiting to cross over, using the new track, that is visible in my pictures. The works will also create a very safe junction at Kirkham West. The branch line has the following characteristics. There are single platform stations at Moss Side, Lytham, Ansdell and Fairhaven, St. Annes-on-the=Sea, Squires Gate, Blackpool Pleasure Beach and Blackpool South. There is one dreadful Class 142 train per hour (tph) between Preston and Blackpool South. The train service doesn’t run on Winter Sundays. Trains take between thirty and forty minutes to travel between Preston and Blackpool South. But there are other issues that should be considered. If you are going to football at Bloomfield Road, as I have several times, Blackpool South is the closest station. Blackpool Pleasure Beach has its own station, but there are reports on the Internet, that the walk between the station and the theme park needs to be improved. I once travelled between Colne and Blackpool South stations on a beautiful sunny day in early September. Northern had laid on a pair of Pacers, working as a four-car train. They were packed with families going for a day on the coast. The conductor told me this often happens, when the weather is good. When I passed through Preston station earlier in the week, I might have seen a notice, saying that the service between Colne and Blackpool South will run all week. There is no passing loop on the branch, so it makes it very difficult to run a more passenger-friendly two tph. Until, the works at Kirkham West Junction are complete we probably won’t know if the junction is being designed, so that a train entering the branch could wait safely for a train to emerge from the branch. But this would be more for reliable operations, than increasing frequency of trains. Ansdell and Fairhaven station is nearest to the course at Royal Lytham. The Open Championship is a very important event on the golfing calendar. Royal Lytham and St.Annes, last held the Open in 2012 and 2001. So it might come back to Royal Lytham in the mid-2020s. Ansdell and Fairhaven station used to have two platforms, as described in Wikipedia. The station was set out as an island platform with tracks on both faces until the singling of the line in the 1980s. Trains now only use the southern face. A disabled access ramp now covers the northern part of the station. So could a rebuild of the station do the following? Restore two platforms on an island at the station. Put in full disabled access. Lomger platforms might be a good idea. The disabled ramp winding away. The platform is probably about a hundred metres long. It would appear that there is space at the far end to extend the platform. I suspect that an ambitious architect with vision, could design a station that met all objectives. The link between Skipton and Colne stations is promoted by SELRAP and has now been backed by the Government and large businesses like Drax, who say it would improve efficiency of biomass deliveries. This map from Wikipedia shows the route. Encourages visitors to the area. 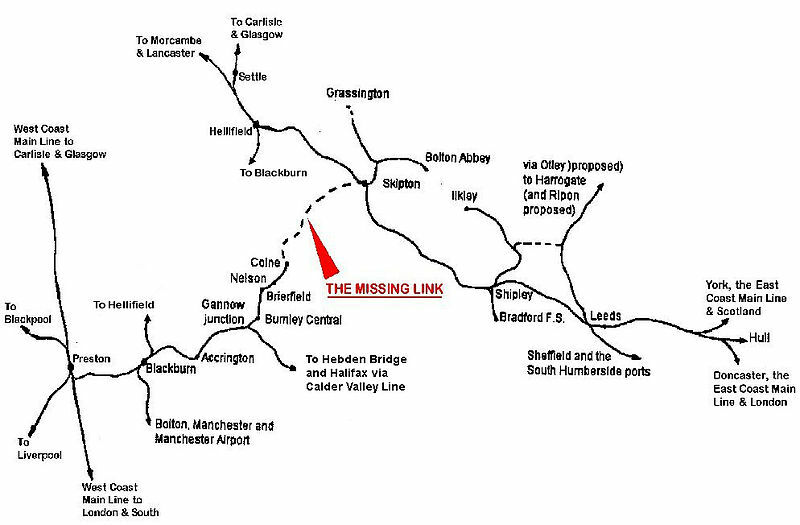 Creates an easy link between Lancashire and the Settle and Carlisle Line. Creates an alternative and faster freight route across the Pennines. It could even become an iconic route famed for the scenery. I feel that if this missing link were to be reinstated, it would be very well-used by passengers. This increase in passengers would surely increase traffic between Colne and Blackpool South stations, means more pressure for two tph. How Fast Could A Train Go Between Kirkham & Wesham and Blackpool South Stations? Currently, the Class 142 trains take around 27-29 minutes to do the journey six intermediate stops. Trains like a Class 769 train have improved performance. They are being converted from Class 319 trains, that were built for high frequency commuter services. The trains have two double-doors on each side of each of the four carriages. Seat layout diagrams show the possibility of wide aisles and a lot of 2+2 seating. They are faster, as the Class 142 trains have an operating speed of 75 mph and this article on Rail Magazine, says that the Class 769 trains can do 91-92 mph on diesel. They have better acceleration and braking. They can probably carry out stops much faster. Newer trains built in the last couple of years will be even better. Other factors will also speed up the service. Level access between train and platform at all stations. Relaying the track to allow higher operational speeds. High-quality train driving and operation. I am sure that the the time for a train to go from Kirkham and Wesham to Blackpool South and back will be substantially reduced. But is it possible to do the trip in under thirty minutes, so that two tph will be possible? Could Two Tph Be Run Between Preston and Blackpool South Without Electrification? I believe that the Class 769 trains could be fast enough to run a two tph service on the Blackpool South branch, when passenger numbers say it is needed and track and station improvements have been completed. An express shuttle could be provided for big events at Royal Lytham. It would run between Preston and Blackpool South stations. The platforms at Ansdell and Fairhaven and Blackpool South stations were to be lengthened to accept two Class 769 trains working as an eight-car train. Network Rail would only need to lengthen two platforms and increase the operating speed of the line. Effectively, by replacing a 1980s scrapyard special with a refurbished train of the same vintage and improving the track, the capacity of the Blackpool South Branch can be increased. If some platforms were to be lengthened, it should be possible to run eight-car trains for events like the Open Championship at Royal Lytham. The Blackpool South Branch certainly doesn’t! Tomorrow, trains between Blackpool South and Colne stations will take a few minutes under two hours. But after the timetable change of May 20th, the journey will take an hour longer. There will be a change at Preston. This change will involve a wait of an hour. I have ridden that line and in the summer, there are a lot of passengers that use it for a trip to the seaside.